Most of you will not remember our classmate Larry W. Maysey, who was killed in Laos in November of 1967. Our Campaign has been established to develop, fund, and build a state of the art monument on Main Street in Chester to honor Larry and others who have served our nation during times of great conflict. We grew up right alongside of Larry, catching frogs in Crystal Lake, playing Little League on the ball fields of Chester, representing the blue and gray on the football field, attending classes at our alma mater, West Morris High, and working for the businesses of Chester. Larry lived in Chester for all of his young life, and he was a friend to many of us, a companion and a role model. When his nation needed him, he was there, not only enlisting for service in Viet Nam, but volunteering for training in the most difficult of assignments. Larry became a member of the elite pararescue unit, training to save lives at the risk of his own. By October of 1967 Sergeant Maysey, Rescue Specialist, was flying rescue missions all over Southeast Asia. On November 9, 1967, Larry, seeking to save the lives of several wounded soldiers was killed himself as his helicopter crashed to the ground. Larry was awarded the highest honor that the United States Air Force conveys. It’s been 35 years since Larry left Chester and we believe it is time to bring him home, by remembering him in this significant way. Larry Maysey lived in <?xml:namespace prefix = st1 ns = "urn:schemas-microsoft-com:office:smarttags" />Chester for all of his young life, and he was a friend, a companion and a role model. When his nation needed him, he was there, not only enlisting for service in Viet Nam, but volunteering for training in the most difficult of assignments. 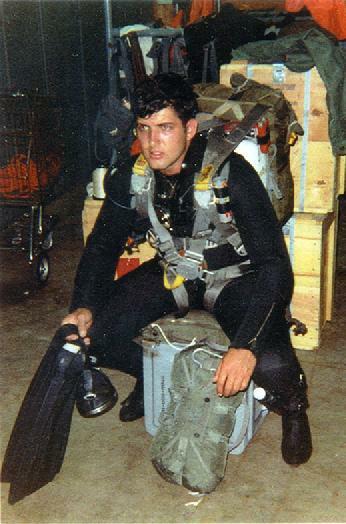 Larry became a member of the elite Para rescue unit and by October of 1967 Sergeant Maysey, Rescue Specialist, was flying rescue missions all over Southeast Asia. On November 9, 1967, he was killed as his helicopter crashed to the ground. Larry was awarded the highest honor that the United States Air Force conveys. Along Main Street, on Memorial Day, 2005 the �Larry Maysey Veteran's Memorial� was dedicated to not only Larry's memory, but to all those from Chester who have died in war.